Learn how to export a sequence, or a part of a sequence, into any of a number of formats. This instruction includes the use of the Export Settings dialog box, and Adobe Media Encoder. 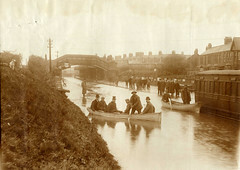 Description: Cullercoats railway station, North Tyneside "flooded after a heavy rain storm". Photograph by Burton Graham. I now want you to think about the form of ‘your’ war memorial. I don't think you will have had any difficulty in knowing what to look for when I asked you whether you had a memorial near to you, and where it was. You may have had to think about the question, and search for the memorial, but you knew what you were looking for. This excerpt from Adobe Photoshop CS5 Classroom in a Book shows you how to animate a 3D postcard. In this excerpt from The Adobe Photoshop Lightroom 3 Book: The Complete Guide for Photographers, Martin Evening shows you how to use the Develop module tools, which provide the best environment to gain the most creative control possible from your color to black-and-white conversions.